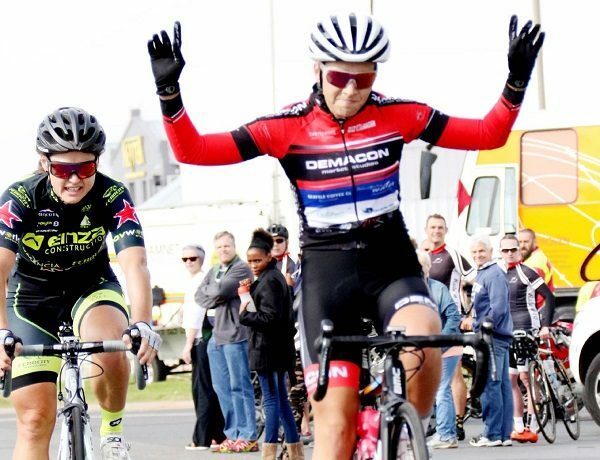 Cyclists with a penchant for sprinting will be fired up to demonstrate their power and prowess when the East Rand Classic road cycling race takes place in Kempton Park, Johannesburg, on April 28. Despite a new race venue at the Acsa parkade adjacent to OR Tambo International airport, ASG Events race director Erick Oosthuizen said the route would remain similar to recent years. "That means it will be another flat route, which will again provide an opportunity for the sprinters to show their skills,” he said of the race formerly known as the Emperors Palace Classic. The East Rand Classic’s feature race will be contested over a distance of 98km, while there is also the option of doing a 48km route. Entries for the event close on Monday. One cyclist with an intimate knowledge of the race’s challenges is Johannesburg cyclist Ryan Harris, who has been second on the podium in the last two years. He confirmed the speedy nature of the route. “Yes, it has always been contested on a flat route, which, of course, makes for a fast race and is very difficult for breakaways to get away,” said Harris. “I wouldn’t describe it as a boring race, but it’s a fact that no attacks can really get away from the main bunch.” He added that that didn’t stop some teams from trying to create a gap. “You always find that teams who do not have an out-and-out sprinter will try to break away, so there are numerous attacks along the route. “But what happens is the peloton is rolling so quickly that they generally bring it back together pretty soon and it’s back to the one bunch. “Everyone follows each other’s wheel and you may get a break which can hover around the 30-second mark, but it’s rare for it to ever get bigger than that.” With the sprinters enjoying the tactics, Harris said it generally came down to the final dash for the line, with teams playing a vital role. “The fast guys love this race because it normally stays together until the sprint finish and . . . The Results Are In… Snupit recently conducted a survey with small business owners who are listed on the platform. The survey’s goal was to better understand how professionals and business owners feel about the experiences and challenges they face doing business in South Africa. 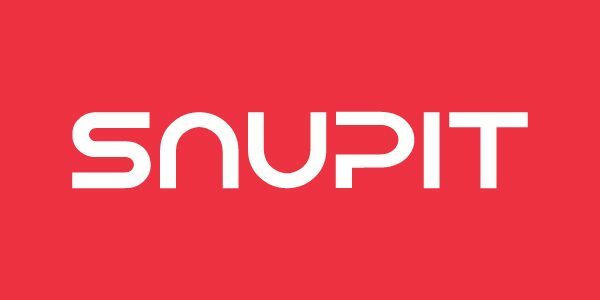 The company had recently participated in the 2019 Business Show in Johannesburg where Snupit met with many users and recorded their testimonials. According to Snupit’s Chief Executive Officer and Co-Founder, Avinash Samlall, the survey is another step to get a better understanding of its users. Talking about the survey Mr. Samlall said, “At Snupit we like to keep a finger on the market’s pulse. An intimate understanding of the Pros using our service is what helps us continually improve and grow. We’re always learning how to make things easier and more efficient for our users.” Following are some of the key findings of the survey: • Snupit is considered an effective marketing strategy. Due to limited funds, small business owners focus on strategies that can produce tangible results. • 72% of respondents used word of mouth and referrals by customers. • 45% of respondents said they have a website. • 28% were using Facebook. • 18% used bulk emails to own list. • 12% used Search Engine Optimization / Search Engine Marketing. • 10% used flyers. • 8% used street pole and furniture advertising. • For small business owners, marketing was more of a time investment than a financial investment. Most respondents did the marketing themselves. • 92% of the businesses who invested in technology in 2018 reported that their investment in technology was already profitable. • More than 50% of respondents felt that if they had more time and resources, they would like to focus on improving their business strategy and business management. • The survey also revealed that technology had a strong impact on their business in 2018. And that they would like to adopt digital . 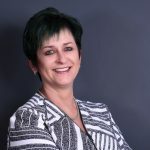 . .
Why attend the Debt Collection South Africa 2019 Conference This signature TCI event – which was attended by more than 500 attendees in the last ten years – will focus on covering all the major “want to know’s” from attendees. With an updated programme covering the state of debt collection industry in South Africa, technology, automation and the digital age; legal framework, governance and compliance, credit risk management and customer engagement, attending the Debt Collection South Africa 2019 Conference, is a must. Do not forget to mark 22 & 23 May 2019 of on your training calendar. 12 reasons why you cannot miss out attending the Debt Collection South Africa 2019 Conference: 1. Learn by absorbing knowledge from the cutting edge speaker panel as they take delegates through a conference programme with topics that will cover all the updates you need to understand and negotiate the present debt collection landscape in South Africa. 2. Network and make friends with fellow delegates - representative from debt collection companies, credit providers, banks, retail and call centres. 3. Get inspired by knowledge sharing that will make you think, think and think some more. In fact you will walk away being regarded as an expert in the field. 4. Catch up with new ways of doings things – from planning to organising to monitoring the debt collection function. 5. Catch up with the latest technology developments in the debt collection field.. 6. Get answers from our speaker panel on all the questions you may have. 7. Meet new vendors and suppliers to the debt collection arena. 8. With over 90% of last year’s delegates saying that It is an event worth attending, it is the best way to spend your training budget. 9. Your competitors are going to be there and surely you do not want them to think you are not part of this important industry gathering? – Southern Africa’s no. 1 commercial debt collection conference! 10. You will have fun with the organisers . . .
“I think you can have a ridiculously enormous and complex data set, but if you have the right tools and methodology then it’s not a problem.” – Aaron Koblin, Entrepreneur in data and digital technologies Personnel from financial services dealing with the following:big data * data engineering * data visualisation * data science * business analytics * data analytics * customer relationship management * business segmentation * customer retention * business intelligence The Evolution of Data Analytics in Banking Conference will focus on bringing the main role players together to discuss innovative ways the existing banking sector workflows can use data analytics to survive and prevail in the rapidly evolving business environment of the digital millennium. Reserve your seat today to pick up a thing or two from the banking and financial services industry leaders presenting on the speaker panel on how to make your data work for you. Send me a registration form, I want to attend The Evolution of Data Analytics in Banking Conference 2019 organised by TCI will take place on the 05 & 06 June 2019 at the Indaba Hotel in Fourways, Johannesburg. Meet our expert speaker panel • Yudhvir Seethram, Head of Analytics, insights and research,FNB • Shukri Cornelius, CEO, WithNova Analytics • Antionette Van Zyl, Senior Solutions Manger:Data Management, SAS • Ilse Kaya Business development, The Digital Databank • Arthur Britz , CEO|Big Data Executive, EOH Company • Ruschka Raidoo, Chief Executive, Raise the Bar Analytics • Jaco van Jaarsveldt , Senior Business Consultant, ScoreSharp • Zakes Socikwa, Cloud Big Data and Analytics Executive, Oracle • Melanie Hart, Partner, Fasken • George Damianov, Head: Data Science and Advanced Analytics, Standard Bank • Neil Lightfoot, Partner in Applied Behavioural Economics, Genesis Analytics • Samantha Rosenberg, Senior Associate in Applied Behavioural Economics, Genesis Analytics • Yolandi Miller, Strategic Data . . .
High level expert speaker panel representation of companies such as Altron Karabina, Augmented Startups, BrandQuantum, Business Optics, Consumer Profile Bureau, IBM Middle East & Africa, Mint Management Technologies, North Wind Digital, Pepper Potts, Smart Messaging.AI, and Strider will address delegates at the Artificial intelligence in Financial Services Conference 2019 The event organised by Trade Conferences International (TCI) is scheduled to take place on the 29 & 30 May 2019 at the Indaba Hotel, Fourways, Johannesburg will feature an insightful programme with topics addressing challenges faced by financial services and banks dealing with AI. Attending this event will give you an exclusive opportunity to network and interact with professionals and decision makers from some of Africa’s biggest companies. Some of the speakers who have confirmed: 1. Adrian van der Merwe, CEO, North Wind Digital 2. Annabel Dallamore, CEO, Strider 3. Andrew Quixley, Watson Platform Sales Leader - Middle East & Africa, IBM 4. Ritesh Kanjee, CEO & Founder, Augmented Startups 5. Paula Sartini, Chief Executive Officer, Brand Quantum 6. Paul Morgan, Business Unit Lead – Data, Planning and Analytics, Altron Karabina 7. Ryan Jamieson, Solutions and Innovation Officer, Altron Karabina 8. Darryl Marcus, Chief Executive Officer, Smart Messaging.AI 9. Alain Craven, Chief Information Officer, CPB 10. Daren Mudaly, Chief Designer, Architect & Process Engineer and Co-Founder, Pepper Potts 11. Peter Reid, Practice Head of Artificial Intelligence, Mint Management Technologies 12. Bradley Smith, Director, BusinessOptics 13. Johan Steyn , Senior Manager: Software Quality Engineering, IQbusiness 14. Nick Truran, CEO, AgileIT 15. Paul St Quintin, AI Enthusiast, Independent Consultant Sections to be covered: • Innovation and technology • Artificial intelligence and the financial environment • Improving customer experience through artificial . . .
• Kerio Control v9.3 delivers high availability and fail-over production • One software license covers two pieces of hardware Johannesburg, South Africa, March 2019: Kerio Control v9.3 is to be launched on 09 April 2019 with high availability and fail-over production. Improvements to the platform also include a new VPN (virtual private network) encryption key with AES, more than 40% VPN speed improvements, and improved IPS throughput. Customers looking to initiate the high-availability feature will have to install a second Kerio Control appliance or virtual machine. Customers can then configure the second device as a clone of the active device using simple and accessible configuration settings. A single software license will cover both pieces of hardware. “The launch of Kerio Control v9.3 will be supported by a webinar that will provide customers with more information around the product and the high availability feature,” says Henk Olivier, MD, Ozone Information Technology Distribution. “There will also be release notes published in the GFI Upgrade Centre, along with the upgrade itself, as of 09 April.” Customers looking to find out more about the upgrade and how to maximise its potential can contact Ozone Information Technology Distribution for hands-on support - visit www.ozone.co.za, call +27 10 591 5588, or email info@ozone.co.za. CLICK HERE to submit your press release to MyPR.co.za. . . . The oncology centre at Netcare Pinehaven Hospital in Krugersdorp has considerably bolstered its cancer treatment options, with the introduction of high dose rate (HDR) brachytherapy, an internally delivered form of radiation therapy for the treatment of various kinds of cancers. “HDR brachytherapy involves the application of a radioactive source in close proximity to malignant tumours in order to destroy them or reduce their size. Used to treat a range of cancers including cervical, uterus, endometrial, and oesophageal, the introduction of this technology at Netcare Pinehaven Hospital provides oncologists with an important tool in the fight against the disease,” says Dr Cindy Aitton, head of Netcare’s Cancer Care division. Dr Paul Paradza, one of the oncologists at the hospital’s oncology centre, says HDR brachytherapy is highly effective, and can be used as a stand-alone treatment in suitable cases, or in conjunction with other cancer treatments such as chemotherapy, surgery and external beam radiotherapy, depending on each particular case. “HDR brachytherapy may, furthermore, be indicated after cancer surgery, to reduce the risk of the reappearance of cancers in high-risk patients, as well as palliatively, to ease problems such as cough, shortness of breath and pain in patients with advanced lung cancer,” adds Dr Paradza. “The HDR brachytherapy unit at Netcare Pinehaven Hospital is equipped with a cutting-edge SagiNova HDR Afterloader, which enables clinicians to better spare tissue around diseased sites, and improve local control of disease.” Dr Paradza explains that the HDR radioactive source is placed inside a slender tube called an applicator, and this is computer-directed to the diseased site to be treated. The source has a high radioactive strength delivering a powerful, targeted dose of ionising radiation safely to a localised area to destroy cancer cells. “The introduction of HDR brachytherapy brings with it a number of benefits for . 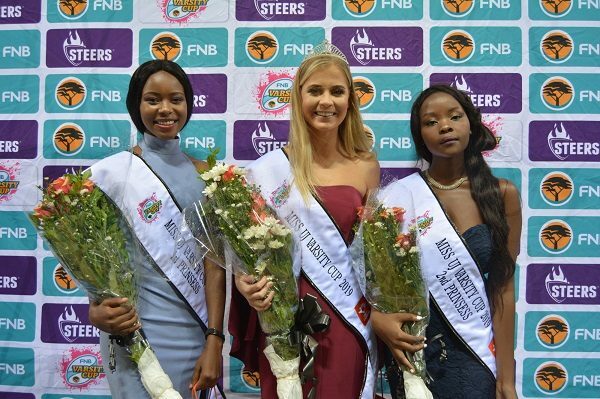 . .
University of Johannesburg student Shandre Hoffman was crowned Miss UJ Varsity Cup when the round-robin phase of the rugby competition drew to a close on Monday. At the crowning ceremony at the UJ Stadium in Johannesburg, the industrial sociology masters student received the top accolade, with Mohau Matinketsa the first princess and Mavelous Mhlanga the second princess. The 22-year-old Hoffman, who lives in Eikenhof in the south of Johannesburg, said she had entered the Miss UJ Varsity Cup contest as she was a strong advocate of social change. "I feel it is our responsibility to help better the lives of those around us," she said. "I believe that if I have the privilege to be associated with this prestigious platform, I will be able to make a real difference on a larger scale. "Secondly, I think sport builds character to live by. It was through my own engagement in sport that I learnt the importance of teamwork. You are only as strong as your weakest link and I realised that it is beneficial to build up those around you." A personal experience in 2017 also allowed Hoffman to learn how to handle the tough things in life. 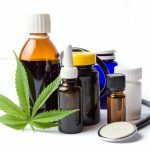 "I had to go through hormone replacement therapy and this caused me to gain weight and break out in acne," recalled Hoffman. "My confidence took a hard knock and there were times when I didn't even want to leave my house, but I learned to love myself in spite of my flaws. "I saw this as an opportunity to continue to grow and love myself, while also spreading the message of body positivity to others." She added that former UJ rugby star and current Springbok wing Aphiwe Dyantyi stood out for her as an example to others. "He was told at a young age he would not make it as a rugby player, yet he still chose to pursue his passion and worked hard to become the success he is," she said. "In life, rejection is inevitable, but Aphiwe's grit on and off the field can be a source of inspiration to pursue your dreams, despite . . . This year’s show will be headlined by SA favourites Mmatema, Dumi Mkokstad, Samthing Soweto and Xolani Mdlalose. In light of the upcoming Easter season, the Soweto Central Chorus of the Salvation Army will once again bring you a musically world class show at this year’s 4th annual Easter Songs of Praise taking place at the Linder Auditorium on Friday, 12 April. This year, music revellers at large will enjoy a show boasting performances by headline acts such as 2015 Idols finalist Mmatema, award-winning gospel music sensation Dumi Mkokstad, Afro-pop favourite Samthing Soweto and ex-Joyous Celebration lead singer Xolani Mdlalose. “This year, we are elated to have these musical geniuses as part of this monumental event. The Easter Songs of Praise aims to encourage people to find the peace that comes from salvation, through music. It’s important that the messages of hope through our music reaches and touches the lives of everyone who hears us,” said Manzini Zungu, the Musical Director. 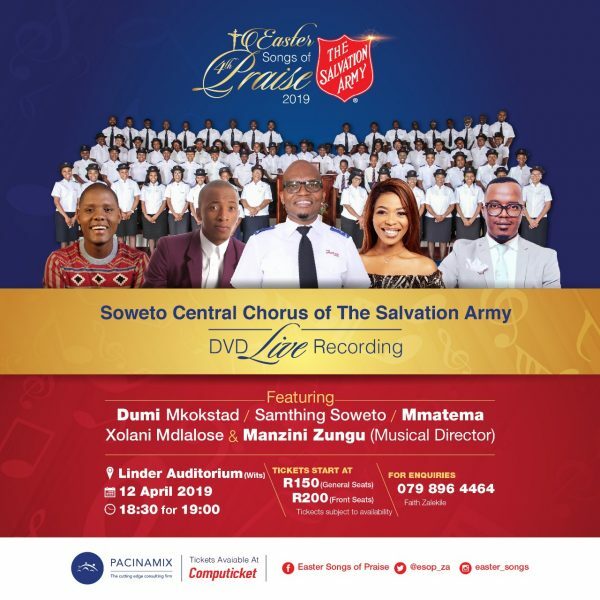 Founded in 2012, the Soweto Central Chorus is a unique brigade and musical division of the Salvation Army’s Soweto Central Corps. The anointed choir boasts over 80 members who have broken generational boundaries. Since it was founded seven years ago, the Soweto Central Chorus managed to catch the attention of some of South Africa’s upper echelons. In 2016, the choir was invited to perform at King Goodwill Zwelithini’s palace-home to the world-renowned Zulu King. The choir’s core mandate is to minister through music and staying true to this, it has spread the word of God through song in events like the Road to Calvary, the 3rd Easter Songs of Praise 2018, Carols by Candlelight and performances at other Salvation Army Corps. Tickets to the Easter Songs of Praise will be available from Computicket from Tuesday 26 March at a cost of R150 – R200 per person. Download the 3rd Easter songs of praise album on Spotify, iTunes, Shazam, Google Play, Deezer and Amazon. Follow us . . . 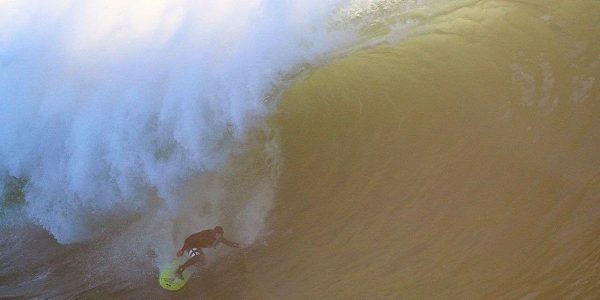 The legendary wave at Mavericks is a notorious beast, where some of the most famous rides in history have been claimed off the Northern Californian coast. Heading to tame the infamous wave, Nic Von Rupp lined up a trip of his dreams and along the way managed to pull of a historical feat that few before him have conquered. Mavericks is a raging A-frame wave with a chunky lip that is challenging and fast, even for the world’s best big wave surfers. Famously a left, the cold-water spot can produce a rare left and it was this challenge that Nic set his sights: “On my way to Mavericks, the only thing I could think of was going left out there.. that wave has so much potential, probably the meanest, biggest paddle approachable slab around. After 3 sessions out there, I quickly saw my dream of slipping into one of these beasts diminishing. So much risk involved.. you gotta be under it, dodging 20ft sets.. seems like all the energy of the right bends into the left and dumps into edge of the ledge. You get pounded, you go to deep dark places, scraping for your life. What about trying to knife a 9.9 into a steep ledge like this. But that’s what makes it special.”- Nic Von Rupp YouTube: https://youtu.be/AQHXXw_prlA CLICK HERE to submit your press release to MyPR.co.za. . . .